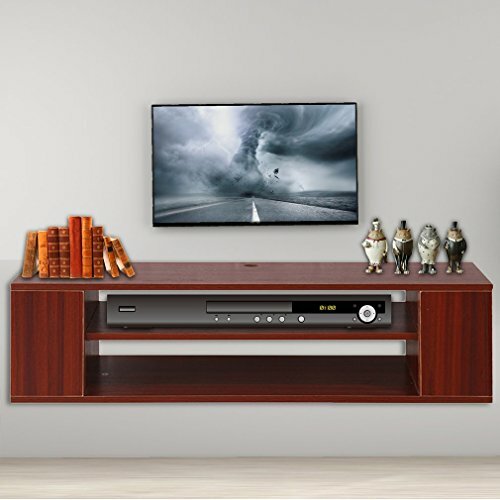 Our wall mount TV stand is open design with large storage. It is made of high quality environmental MDF board. Its simple wall hang design is not only beautiful but also saves space. Whether it's practical or ornamental, it will give a new decoration of your home. It can store Set Top Box ,Soundbar, CD and other electronic components. Reduce the clutter in your home and hold the most items in the least space. ➊Wall-mounted TV cabinet help to save your home space. ➋It has large storage space, the top can be placed many things. ➌You can put CDs, DVDS and even books and magazines in the cabinet that help to keep your home tidy and clean. ➍It's ideal for game day, date night, entertaining friends or that late night television show binge.The TV stand Entertainment center features one compartment for A/V components and a bottom shelf that has room for your media such as Blu-Ray Disc or DVDS. ➎Exquisite workmanship,high performance and it is so stable. Easy to match any style of your home and room. Wide range of applications that can place it in your lounge room, living room, bedroom or study and more places. ➍Exquisite workmanship,high performance and it is so stable. ➎Wide range of applications that can place it in your lounge room, living room, bedroom or study and more places. 100% satisfaction.